Cancer genomics projects employ high-throughput technologies to identify the complete catalog of somatic alterations that characterize the genome, transcriptome and epigenome of cohorts of tumor samples. Examples include projects carried out by the International Cancer Genome Consortium (ICGC) and The Cancer Genome Atlas (TCGA). A crucial step in the extraction of knowledge from the data is the exploration by experts of the different alterations, as well as the multiple relationships between them. To that end, the use of intuitive visualization tools that can integrate different types of alterations with clinical data is essential to the field of cancer genomics. Here, we review effective and common visualization techniques for exploring oncogenomics data and discuss a selection of tools that allow researchers to effectively visualize multidimensional oncogenomics datasets. The review covers visualization methods employed by tools such as Circos, Gitools, the Integrative Genomics Viewer, Cytoscape, Savant Genome Browser, StratomeX and platforms such as cBio Cancer Genomics Portal, IntOGen, the UCSC Cancer Genomics Browser, the Regulome Explorer and the Cancer Genome Workbench. Cancer genomics benefits from high-throughput technologies that allow the comparison of the genomic sequences, epigenomic profiles, and transcriptomes of tumor cells with those of normal cells. These technologies often characterize different types of somatic alterations (or variations) in a tumor cell population that are absent from normal cells - including copy number alterations (CNAs), mutations, gene expression changes and methylation changes [1–4]. Together, these somatic alterations constitute multidimensional oncogenomics datasets that describe the variations that coexist in common elements (for example, the genes) of the genome (or transcriptome) of a particular cohort of tumor cells. Such data are currently being used to identify cancer-driver genes and pathways, to discover molecular targets for new therapies, and to define molecular profiles that characterize clinically meaningful patient categories. An array of analytical methods are currently used to exploit the information contained within this multidimensional layout [5–12]. Along with computational and statistical methodologies, effective visual exploration by experts is crucial to successful extraction of knowledge from oncogenomics data. For example, this step might be key to unraveling rare genomic events, verifying data quality at maximum resolution or identifying key players in cancer development. Thus, researchers need intuitive tools that allow the visual integration and simultaneous exploration of both different types of alterations and clinical information. Many data visualization tools have been developed in recent years to support genomic studies. In this review, we revisit the most common ways in which these data are visualized, and present selected tools that allow researchers to visualize multidimensional oncogenomics datasets effectively (Table 1). 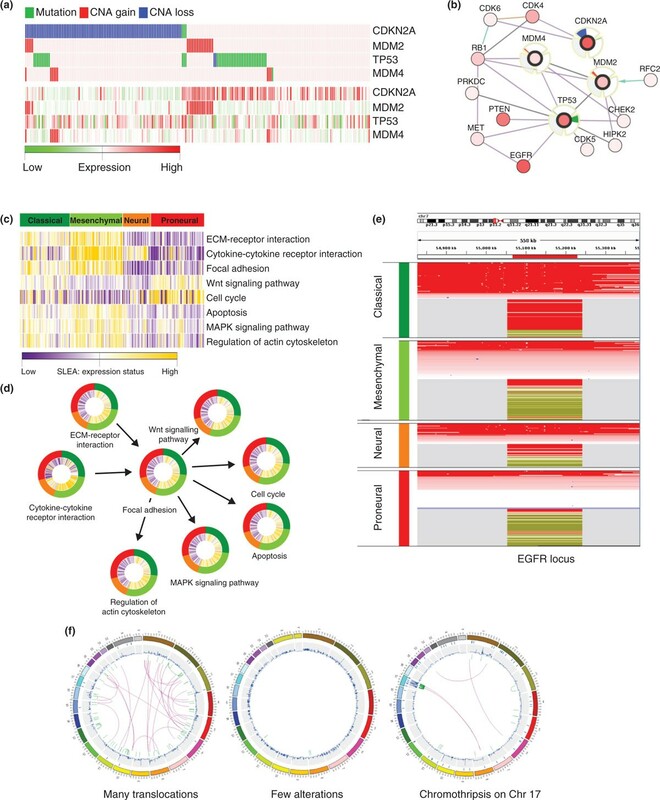 To aid our review of the tools, we describe four case studies that illustrate their use: the visual exploration of 1) alterations in cancer-driver genes per tumor through a representation based on OncoPrint (described below); 2) cause-effect relationships between different alteration types in tumor samples, through the use of Gitools and the Network viewer from the cBio Cancer Genomics Portal; 3) the stratification of tumor samples based on clinical annotations, using CircleMap, the Integrative Genomics Viewer (IGV) and Gitools; and 4) dramatic structural alterations that encompass the rearrangement of large chromosomal regions, employing the Circos tool and data obtained from the Catalogue of Somatic Mutations in Cancer (Cosmic). We distinguish between three main approaches commonly used to represent multidimensional oncogenomics data: genomic coordinates, heatmaps and networks (Figure 1). These three approaches complement each other, and each is best suited to answer different specific questions. Cancer genomics projects generate multidimensional data for a cohort of patients. Different technological platforms will screen for different genomic and epigenomic changes in each patient, generating multidimensional data sets. The data are usually represented by clinical data along with one or more of the three main types of visualization tools: genomic coordinates, matrix heatmaps and networks. A common way to visualize oncogenomics data is to show alterations tied to their genomic loci. This approach is well suited to provide answers to questions about the genomic topography of alterations or to inspect particular genome loci. We distinguish between two main visualization approaches that use genomic coordinates: Genome Browsers and Circular Plots. 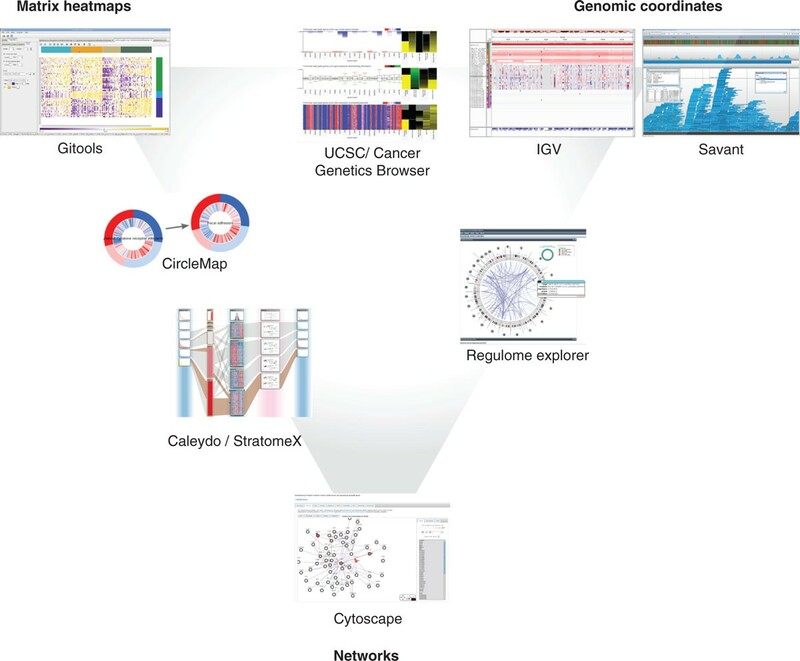 Three of the most popular genome browsers employed to visualize cancer alterations are the Integrative Genomics Viewer (IGV) , the UCSC Cancer Genomics Browser , and the Savant Genome Browser . All three support multiple data formats that are used to represent various types of alterations. They display the alterations in each tumor sample as genomic tracks, which can be loaded onto the browser and navigated by zooming and by scrolling to particular genomic regions. The IGV and Savant genome browsers work as desktop applications and are particularly suited to the display of aligned sequencing data. IGV has a special focus on visualizing integrated datasets that include both array-based and sequencing-based data as well as clinical information about tumor samples and donors. The clinical information displayed in vertical lines in conjunction with the data tracks can be used to sort and group the tracks, thus simplifying the stratification of samples (Figures 2 and 3e). A further advantage of IGV is the split screen view, which allows multiple loci to be displayed next to each other. On the other hand, Savant offers an application programming interface (API) that allows third-party developers to extend and add visual, analytic, navigational, and data loading functions to the genome browser. Available plugins include edgeR , aimed at detecting differentially expressed genes or regions. Other plugins are described in the Savant Genome Browser manuscript . Another strength of the Savant genome browser is the visualization of paired-end reads . Screenshots of tools that are frequently used in cancer genomics research distributed according to their visualization principles. Each of the three visualization methods - matrix heatmaps, genomic coordinates and networks - are associated with a point of the triangle. Tools that are placed close to one of these points mainly use the visualization method associated with that point; those placed in between use a mixed-model visualization method. Four case studies are represented using one or several of the major visualization methods applied in oncogenomics. (a) Heatmap of oncogenomic alterations ordered by mutual exclusivity plotted with Gitools. In the upper half of the image, colors indicate the type of alteration: mutations (green), CNA gain (red) and CNA loss (blue). The heatmap below shows expression data (high expression in red and low expression in green) for the same samples and genes, allowing the visual observation that genomics regions whose copy number is amplified tend to have higher expression values. (b) The same data as in (a), with the same color code for alterations, represented as a network of functional interactions between the genes, extracted from the cBio Cancer Genomics Portal. The halo around the four selected nodes is divided into three sectors. Changes in the proportion of samples with altered copy number are indicated in red (gain) or blue (loss) in the top sector, whereas changes in the proportion of samples with mutations are indicated in green in the lower-right sector. Expression changes are shown in light red (increase) and light blue (decrease) in the lower-left sector of the halo. Panels (c-e) include clinical information. Each tumor sample is assigned to one of four subtypes of glioblastoma, color-coded as dark green (classical), light green (mesenchymal), orange (neural) and red (proneural). (c) Heatmap of pathway expression levels plotted with Gitools. Each column is a tumor sample. The subtype is represented in colors in the top row and each row represents a biological pathway. The color of each cell indicates the Zscore of the sample level enrichment analysis (SLEA) of the pathway in the sample. Clear differences in the expression values in different pathways can be observed for different cell subtypes. (d) Same data as in (c) represented in the form of a network, drawn using CircleMap. Each node is a pathway and its edges indicate functional interactions between pathways as extracted from KEGG. The two halos around each node indicate the Zscore of the pathway in each sample and the clinical subtype. (e) CNA and expression data for the EGFR gene region of glioblastoma samples as shown by IGV. The top part of the plot indicates the genomic position we are observing. Each sample is shown as a horizontal track, ordered by clinical subtype. Within each clinical subtype, the tracks in the upper half illustrate CNA whereas those below show expression. This visualization reveals clear differences in the CNA and expression of the EGFR locus in different clinical subtypes. (f) Adaptations of Circos plots of three breast tumors with three very different alteration landscapes. The four circles in each plot, from outermost inwards, represent the human chromosomes, mutations, copy number alterations, and structural rearrangement. The web-based UCSC Cancer Genomics Browser offers an easy-to-use interface that can be used to browse cancer genomics datasets, such as those of The Cancer Genome Atlas (TCGA), which have been pre-analyzed with various tools and include clinical information. The user can choose between different plotting types: heatmaps, box plots and proportions. The features are shown in either the classic representation bound to genomic locations or in a gene-set visualization, analogous to the IGV split-screen view, resulting in a browser-like heatmap (Figure 2). Unlike IGV and Savant, the UCSC browser does not allow users to upload data. Circos  is a flexible and popular tool that can be used in many different research fields to plot circular ideograms. In the case of multidimensional oncogenomics data, the genomic coordinates of all chromosomes are represented in a circular layout (Figure 3f). This tool aptly illustrates relationships between distinct alterations, represented as data tracks outside the ideogram, that take place at different locations within the genome. These relationships between regions are normally depicted as ribbons. Intra- and inter-chromosomal translocations are particularly well represented in Circos. Genome browser tools in general have limited capacity to display relationships between genomic features that are independent of location, such as the coordinated expression of genes. The IGV and UCSC Cancer Genomics Browser attempt to tackle this problem using the split-screen and heatmap approaches, respectively. Another issue with visualization-based genomic reference is that it falls short in visualizing extensive genomic rearrangements. The circular layout of Circos can compensate for this deficit, or it can be resolved by the use of specific tools such as Gremlin . Many other tools also perform specific tasks, exploiting the genomic coordinates representation scheme. For example, putative translocation events can be verified by the command-line tool Pairoscope , which generates relational diagrams of paired-end sequencing reads to aid in the discovery of translocation events. To view and analyze single nucleotide polymorphism (SNP) and comparative genomic hybridization (CGH) array alteration data tools and methods such as VAMP  and waviCGH  are options based on web technologies, whereas Genome Alteration Print  is a desktop application. Furthermore, it has been proposed that there should be a move towards visualizing genomic rearrangements, such as gene fusions, graphically to emphasize the order of the rearranged segments rather than the genomic distance between the breakpoints . Heatmaps are graphical representations that are frequently used to describe transcriptomics and genomics data stored in the form of matrices. In oncogenomics datasets, the columns in a heatmap usually correspond to tumor samples, whereas the rows are genes, transcripts, microarray probes, or other genomic elements (Figure 1). The color of each cell represents a value indicating a measurement of, let's say, for simplicity, the gene in the tumor, such as its expression level or mutational status. As matrices, heatmaps impose no restriction on the order of the data. This allows data from distant genome loci to be grouped and visualized together for comparison. For example, genes in the same pathway or genes that are associated with certain tumor types might be grouped together. In other words, rows or columns can be clustered according to molecular or clinical features. It is precisely this flexibility to explore visually patterns within the alterations that are correlated to external characteristics, such as the function of genes or the features of the tumor samples, that make heatmaps so popular as a way of representing multidimensional oncogenomics data. Many tools and programs generate heatmaps from numerical or categorical matrices. We focus here on tools that have features that are particularly well suited to the visual exploration of multidimensional oncogenomics data. Gitools  is an open-source java application for the analysis and visualization of matrices using interactive heatmaps. The heatmaps in Gitools can contain multiple dimensions, that is, multiple values in each cell, which makes it especially well suited to the exploration of multidimensional cancer genomics data. Its interactive capabilities allow the user to filter, sort, move, and hide rows and columns in the heatmap and to launch several common exploratory analyses (such as correlation, clustering, enrichment and differential expression analyses). Multi-value data matrices, which can contain all types of alterations detected across a cohort of cancer samples, can be explored visually in Gitools, either focusing on a single dimension (that is, one type of alteration) or fixing one dimension to explore its influence on others. Gitools also allows the integration of these data with clinical information. The cBio Cancer Genomics Portal  is a web resource for visualization of oncogenomics datasets that uses heatmap representation, among other options. The OncoPrint heatmaps display alterations in arrays of genes across tumor samples. Individual genes are represented as rows, and individual cases or patients as columns. Different colors and shapes are used to show different alteration types, so that multiple alterations in a patient's gene can be distinguished easily. IntOGen is a resource that can be used to analyze and visualize oncogenomics data . It presents different values, estimating the accumulation of somatic mutations, CNA or transcriptional alterations in genes and pathways across tumor samples. Pre-computed data for more than 300 cancer genome experiments are currently available. Web-interactive heatmaps are used to explore gene and pathway alterations across samples and tumor types. Caleydo StratomeX  is a visualization tool built upon the Caleydo framework , with a focus on exploring interdependencies between different stratifications of cancer samples within a given study. Genomics data on different alterations can be clustered and visualized as matrix heatmaps. The clusters of different alterations are connected by ribbons whose widths correspond to the number of samples shared by the connected clusters. Clusters can also be visualized as pathway diagrams, allowing the researcher to observe the impact of alterations on pathway function (Figure 2). Heatmaps can also be represented not as rectangles but as circles, as with CircleMap  (Figure 2). With this command-line tool, dimensions can be aligned in a circular plot accompanying a gene, which is represented as a circle that can be attached to other genes in a network layout (Figure 3d). A general limitation of the heatmap visualization is that structural relationships between genes are difficult to grasp. For instance, it is very hard to discern whether the coincidence of CNA in several genes reflects a possible synergy or is simply a result of their location within a recurrently amplified or deleted chromosomic fragment. Gitools tries to solve this problem by offering the possibility of adding genomic annotations to the rows that can encode functional or structural information. Caleydo StratomeX solves this problem by incorporating pathway diagrams displaying functional relationships between the genes, and CircleMap plots can also be used as nodes to construct a network diagram for this purpose. Networks represent functional relationships between different entities, such as genes. This type of information is difficult to represent in heatmaps and non-circular visualizations of genomic coordinates. Genetic features can be coded in node attributes such as color, size, or shape. Different alterations can be displayed as additional halos around the node. The network arrangement allows the researcher to explore visually clusters of nodes representing highly interconnected altered genes that can constitute driver pathways or subnetworks. Cytoscape , a collaborative open-source project, is a widely used and intuitive network visualization and analysis tool in genomics research. No special bioinformatics knowledge is needed to use Cytoscape. The properties of the nodes and the edges and the network layout are customizable, and the comprehensive array of plugins constitutes an added value for researchers. This tool has proven useful for integrating expression data into a gene network , as well as for mapping genes with cancer somatic alterations directly to a functional interactions (FI) network  that identifies subnetworks of altered genes in order to find cancer drivers. A web version, Cytoscape-web , is compatible with common internet browsers and facilitates interaction with the networks displayed. The cBio Cancer Genomics Portal  implements an adaption of this tool optimized for visually exploring multidimensional oncogenomics data from TCGA . Node colors and halos encode the alteration status of cancer genes. Representation of the genomic alterations present in individual tumor samples in network viewers presents a challenge. As a consequence, many details about the individual tumor samples are normally left out of network figures. In the case of the cBio Cancer Genomics Portal network viewer, this problem is alleviated by the inclusion of plots that show the proportions of samples with different genomic alterations. Similar effects can be achieved with plugins for Cytoscape that transform nodes into pie charts (such as GoogleChartFunctions  and nodeCharts ). The case studies presented here elaborate on four different oncogenomic research questions that can be answered visually with the available tools and resources. The description of the case studies focuses on their biological interpretation. Supporting documentation on how to generate images corresponding to those in Figure 3 is included in the 'Additional file 1 and 2'. Learning to use most of these tools requires a certain investment of time, and tutorials provided by the developers are highly recommended as a starting point. Distinguishing the alterations that give cancer cells a selective advantage (drivers) from those that are merely side effects (passengers) of the destabilization of the cancer genome is a major problem in oncogenomics research. Several new methodologies [5–8, 11, 38, 43–46] address this problem by exploiting the properties of driver genes. For example, the mutually exclusive alteration of genes in a pathway is a characteristic of cancer drivers [5, 6, 47]. One plausible explanation of this behavior is that an alteration that targets an affected pathway does not confer further selective advantage to the cancer cell. A built-in Gitools option sorts genes and samples within a heatmap to present the pattern of mutually exclusive alterations, which is one approach to visual exploration of driver genes that are involved in the same pathway (Figure 3a) . Oncoprint (cBio Cancer Genomics Portal) uses the same principle to display the alterations across TCGA datasets of a gene set provided by the user. An alternative approach to identify cancer drivers involves mapping altered genes to a FI network (Figure 3b) [7, 38, 46]. The Reactome FI Cytoscape plugin offers this functionality. After a gene list is submitted, a FI network is constructed using so-called linker genes: genes that are not in the user-submitted list but that can connect two of the submitted genes. Usually, this approach identifies network regions in which recurrently altered genes, which are thought to point to driver genes and subnetworks, are enriched. The visualization of genes and their alterations in the form of FI networks is thus very useful (see Figure 3b for an example). The effect of genomic alterations can be manifested at the genome, transcriptome or proteome level. Single nucleotide variants (SNVs) might not directly influence transcription of the mutated gene but usually affect protein functionality. On the other hand, CNA and changes in methylation status frequently perturb the expression levels of the altered genes or other genes under their control. Determining the cause-effect relationships of such alterations is important to our understanding of cancer mechanisms. One approach is to plot one type of alteration (for example, CNAs) in a heatmap, sorting the tumor samples to separate diploid genes from altered genes. Changes in gene expression values, presented in another heatmap, can then be readily compared between these two groups (Figure 3a), allowing the detection of any significant differences. Gitools can load a multidimensional data matrix containing different alterations for each sample, and a simple switch between the values shown in the heatmap cells easily changes the display from one heatmap to the other . Networks offer another way of visualizing cause-effect relationships. The interactions between genes in a network can represent their functional relationships, for example, one gene might regulate the expression of another. Overlaying the alterations within a cohort of tumors on top of each node of the network might illustrate the effect of a gene alteration on the expression of other genes in the network (analogous to Figure 3b). The network viewer of the cBio Cancer Genomics Portal supports the visualization of expression data, if available. Similar visual effects could be achieved in Cytoscape by mapping data onto node properties. Cancer is a complex disease. Tumors that seem very similar when examined through conventional diagnostic methods might look markedly different from the molecular viewpoint, which can lead to different outcomes or treatment responses. Therefore, the molecular features of tumors can be used to stratify patients to support more accurate clinical and therapeutic decisions. Over the past decade, molecular stratification of tumors using expression microarrays has been an important area of cancer research [50–53]. The visualization of molecular alteration patterns in a heatmap is often used to explore subgroups of tumors and to associate them with particular clinical features. These heatmaps usually portray the expression patterns of genes or transcripts across samples, but the benefit of data analysis at the level of gene groups, for example pathways [54–56], is increasingly evident. Stratification and visualization can also be done at the level of pathways or other gene modules (Figure 3c), for example using sample level enrichment analysis (SLEA) [57, 58], which analyzes the transcriptional status of pathways (or other gene sets) in each tumor sample. In the case of multidimensional oncogenomics data, various clinical features and alterations such as CNA or changes in mRNA or microRNA expression can be used to cluster or stratify tumors, leading to different groupings of samples. In Figure 3c,d, we show ways of representing the results of applying SLEA to the TCGA glioblastoma dataset, with the samples grouped by the corresponding glioblastoma subtype. The alterations are visualized using both Gitools and CircleMap. Please see the 'Additional 1 and 2' for a more detailed description of this process. Stratifications can also be meaningful when exploring a single locus. Figure 3e illustrates the same grouping of samples by glioblastoma subtype, employing copy number and expression data from the TCGA glioblastoma study using IGV (Figure 3e). Caleydo StratomeX is especially well suited to exploring relationships between groups of samples (Figure 2). These relationships are visualized as ribbons of varying width drawn between neighboring columns. Wide ribbons encode a high co-occurrence of samples in different groupings, whereas their absence indicates mutual exclusion. This coding provides a straightforward and scalable overview of the consistency of group memberships of tumor samples across different data types. Various alteration phenotypes have been observed in cancer cells. One of the most conspicuous of these is the mutator phenotype : tumor cells typically have an abnormally high mutational burden. Tumor samples with chromothripsis [60, 61] or many chromosomal translocations are also common. Categorization of the alteration events in a cancer cell population could influence the therapeutic decision, and requires a simultaneous exploratory view of all the alteration events. One approach to exploring visually all the alterations of a sample is the circular genome mapping proposed by Krzywinski et al. using their tool Circos . Several cancer studies [59, 62–64] have used Circos to show the landscape of alterations. This tool is highly configurable, which is evident from the figures in the cited publications. One compact figure can represent all somatic alteration events in a given tumor sample. Data from different alteration types can be organized in layered circles while rearrangement events occupy the innermost space. Figure 3f is composed of three Circos plots of breast cancer samples  as they are represented on the Cosmic website . The outer-most circle of each diagram represents the human chromosomes, followed by a plot of ticks showing point mutations. The next layer plots CNA along all the chromosomes; the links in the middle visualize the structural rearrangements. The recently developed ggbio package  for the R programming environment allows, among other things, the creation of circular genome plots, and supports a variety of data formats for sequencing data. Researchers often need to use several of the complementary tools described here to explore their datasets. Nevertheless, the landscape of visualization tools for multidimensional oncogenomics data seems rather fragmented. This is the result of different groups focusing on the development of tools optimized to solve one particular visualization issue, which is probably a more efficient way of investing resources instead of engineering one single monolithic tool that has all possible visualization capabilities. Unfortunately, this fragmentation makes the use of different tools problematic: they accept very different data formats, they look different to users and so on. Thus, users need to spend time learning how to use each tool and reformatting their data to each tool's requirements. This extra effort could be alleviated if developers were to facilitate the combined use of tools. One of the major efforts to develop a universal interface that will bridge the gap between different bioinformatic tools is the GenomeSpace project . GenomeSpace allows the user to store data in a common repository and the same web interface guides users to execute the integrated tools, load data, and store results. Conveniently, it contains several built-in converters for some often-used data formats. Several tools listed in Table 1 (IGV, Genomica, Cytoscape and Gitools) are included in this pilot project. This platform interface approach is promising and possibly the most user-friendly option for users who lack a background in bioinformatics. Another approach to facilitate the use of several tools is the creation of direct tool-to-tool interfaces. These are possible when a tool offers an API that defines the form of communication between the tool and the rest of the world. There are different kinds of APIs, which allows the implementation of different approaches. If the API offers external control, it can send the tool a command and indicate whether the execution of this command has been successful or not. This is the case, for example, with IGV and Gitools: both offer a set of commands that the other application can use. Gitools has a built-in link that sends a 'find locus' command to IGV, whereas IGV exports data into a matrix format and commands Gitools to load it. In practical terms, this means that the user can explore the same data with two complementary visualization tools that can communicate with each other. Another kind of API can be used for plugin development. This is a general way of creating new capabilities for established tools. As mentioned above, Cytoscape and Savant support plugability, meaning that they possess internal commands that can be used by an application to extend the functions of the tool. Unidirectional APIs are typically employed by databases and allow easy data transfer between the data source and tools. For example, IGV's external control of the software allows the cBio Cancer Genomics Portal and GenePattern  to load data directly into IGV, and Gitools accepts imported data for all BioMart  databases. The cancer genomics research field is rapidly evolving in parallel with advances in high-throughput genomics technologies. This evolution of the field requires continuous advancement in visualization techniques and tools. For instance, the amount of data it is possible to generate for an oncogenomics project continues to increase, requiring visualization tools that very efficiently load and process large amounts of data. As this rapid scientific evolution continues, cancer researchers are highly dependent on computational scientists and bioinformatics professionals to help them manage, analyze and visualize data. To speed up research advances, the barrier between the large amount of data generated in oncogenomics projects and the effective exploration of these data by cancer researchers must be minimized. Visualization and exploration tools should be intuitive and easy to use, not requiring computational or bioinformatics expertise. Not all tools currently meet these standards, as some programming or even technological knowledge is required of the user. In recent years, however, there has been an important effort to facilitate access by 'non-bioinformaticians' to visualization tools for the analysis of oncogenomics data [20, 31, 32]. Continued work to improve the usability of visualization software is highly important, but requires great effort from developers for low scientific reward when compared to the development of new methods or visualization techniques. Funding agencies must understand that increased investment in personnel dedicated to the development and maintenance of new tools, as well as user training and support, is crucial to the achievement of improvements in the field. The complexity of oncogenomics data and the multitude of questions to be addressed ensure that a static plot is often insufficient for data visualization. The user needs to explore the data interactively in order to address a wide range of questions. Several tools listed in Table 1 (including IGV, Gitools and Caleydo) make use of interactive visualization techniques to make this possible. Other web frameworks with various visualization and some optional analysis possibilities are being developed, including the cBio Cancer Genomics Portal , IntOGen  and Regulome Explorer . Open source and plug-in architecture facilitates quick adoption of these new platforms. Although not discussed at length in this review, the use of cancer genomics data visualization in the clinical setting is likely to become a key topic in the near future, as the results of cancer genome projects begin to be translated into personalized cancer medicine. Clinicians will be the main users of this information as they make decisions regarding patient treatment. In this regard, simple, efficient tools that support the visual stratification of tumor genomic profiles and that highlight their relationships to known drugs or treatments will be more useful than the existing research-oriented tools. As a result, it will probably be necessary to develop specialized clinical tools or to adapt existing ones to the clinical setting. This has been achieved in the case of the MedSavant Browser , a clinical adaption of the Savant Genome Browser. 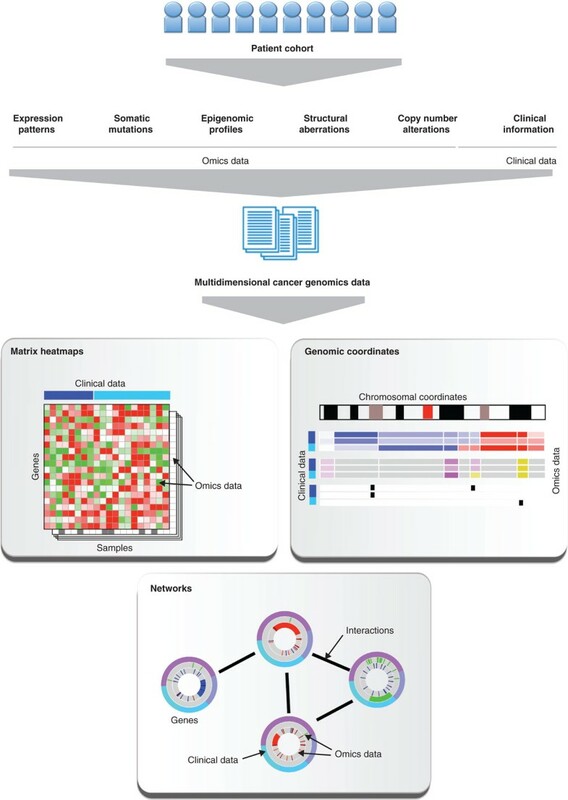 In summary, visualization of multidimensional oncogenomics data is essential for the extraction of useful knowledge from the vast amount of data generated by high-throughput technologies. Important efforts have been made in recent years to create visualization tools that can explore these datasets. Further efforts are needed to develop those resources and to create new tools to meet the changing needs of the field. Long-term investment and funding are needed to guarantee the maintenance, improvement, and evolution of visualization tools beyond their first publication. We acknowledge funding from the Spanish Ministry of Science and Technology (grant number SAF009-06954 and FPI fellowship assigned to MPS), and from the Spanish National Institute of Bioinformatics (INB). We are thankful to Elaine M Lilly for assistance with language editing. The authors declare no competing financial interests and declare the authorship of Gitools and IntOGen.